The Nashville Predators showed their playoff savvy as they came back to defeat the Winnipeg Jets in a do-or-die Game 6 victory. The more experienced playoff contender won last night... when they had to and forced a deciding Game 7 Thursday night in Nashville. The Nashville Predators who lost to the Pittsburgh Penguins in six games in the Stanley Cup Finals last season now have an opportunity to make another appearance if they can take a Game 7 from the explosive Winnipeg Jets get by the amazing Vegas Golden Knights. Whenever a NHL team can score early in any playoff game, it's a good start. Viktor Arvidsson agreed and scored at the 1:02 mark to give the visiting Predators a 1-0 lead. Arvidsson broke down the left wing, blew a tire and crashed into the boards behind the Winnipeg net. He then got up and got to the slot area as Roman Josi sent a shot from the left point that hit Arvidsson as he was falling. The on-ice officials called it off saying that he hit it with a high stick, but after review it was determined to be a good goal. He was actually in the process of falling... ducking from the high shot when the shot hit him on the way to the net. It seemed like the Nashville club decided the best way to stop the Jets was to hit them before they get their engines started, and it seemed to work. At 8:16 Filip Forsberg just grabbed a new stick from the bench, and glided down the right board, barely staying onside... and broke in on Hellebuyck scoring as he fell from a check by Ben Chiarot. It was a circus goal, and one that kinda broke the Jets' back falling behind by two goals at the near halfway point of the game. 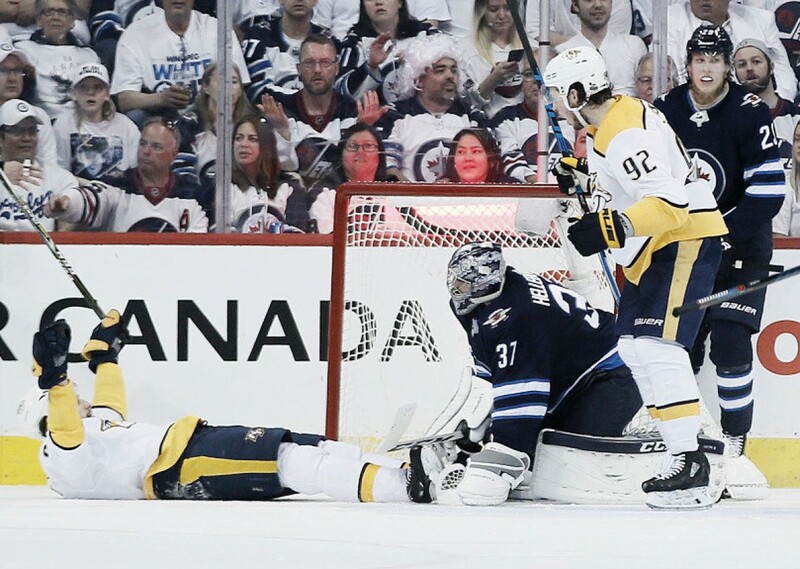 The shots were even between the two Western Conference teams with Winnipeg throwing nine at Pekka Rinne and Nashville sending seven at Connor Hellebuyck. Both teams headed to the locker room with the Predators maintaining their 2-0 margin. This time Forsberg stayed on his skates, but this goal showed his amazing ability to control the puck, which it seemed as if he had it on a string at times. He received a great pass from Arvidsson but would have had to shoot a backhander, so decided to get cute and pass it between his legs so he could shoot from his natural right-hand position. It tricked Hellebuyck and the the puck was sent high and trickled into the net. Both Arvidsson and Forsberg collected two goals and an assist to pace the Predators' attack. That made it 3-0 Winnipeg at the 5:55 mark. Winnipeg fired 15 shots on Rinne, but had no answer. Rinne was making saves all night in a clutch performance to keep his team in the running for a possible Game 7 in Nashville. Arvidsson added an empty net goal at 15:58 as the Jets got desperate and pulled Hellebuyck early in hopes of catching up. With saves like this, it wasn't going to be Winnipeg's night. Rinne had 34 saves and he helped pace his team to get to a decisive Game 7. It's all you can expect from your goalie, right? With Winnipeg being shutout for the first time in the playoffs, it sets the stage for a dramatic Game 7 in Smashville. It does however delay the next round of playoffs until after Thursday, but hey... at this time of the year all the players will welcome a deserved rest. One thing is certain if the Winnipeg Jets decide to rest their scoring attributes they will not be moving on to the Conference Finals. The Nashville Predators can guarantee them that. It's now a one-game series, winner take all. Will the Jets come back to play their offensive game, or will the Predators prevail? Let us know in the comments section, and what about that circus between the legs goal by Forsberg? Was that sick or what?